15-year old Marie and 6-year old Sean are neighbours. Whilst Sean goes on hunting trips with his father Filthy, a secret den on the hill has become Marie's refuge from a world she is finding increasingly difficult to cope with. One night, while Marie is babysitting for Filthy, Sean suddenly dies in her carge. As Filthy's grief threatens to overwhelm him, Marie becomes aware of another presence. It follows her from the hill into the city and it won't leave her alone. It wants something from her. Is it the spirit of Sean? Or her unresolved past creeping into her present and distorting her perception of reality? Set half in shallow suburbia and half in the mystical, eerie woods, In the Dark Half tells the compelling and mysterious story of a teenage girl's journey through her own unsettled imagination. Starring Tony Curran (Red Road), Lyndsey Marshal (The Hours) and Jessica Barden (Tamara Drew), it was the first film to go into production under the umbrella of South West Screen's iFeatures digital filmmaking scheme, the BBC Films and Bristol City Council-backed 'micro-studio' initiative. The initiative was launched with the aim of harnessing cutting-edge digital technology and low budget production methods in the Bristol area. 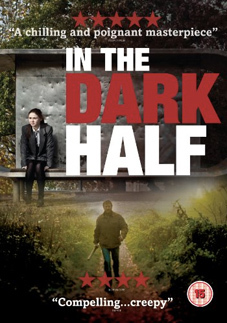 In the Dark Half will be released on UK DVD on 8th october 2012 by Verve Pictures at the RRP of £15.99. The only extra feature listed is a trailer.